Despite marijuana possession being decriminalized in New York, in the last twenty years the police in New York State have still made about 800,000 arrests for possession of small amounts of marijuana. On average, more than 60 people are arrested every day for marijuana possession in New York State, making marijuana possession one of the top arrests in the state. 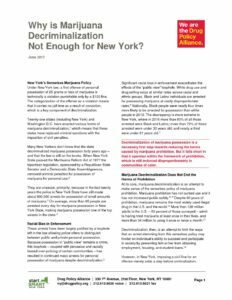 In New York, marijuana decriminalization has fallen short and will continue to do so. It has not succeeded in curbing the costs or the harms of prohibition and has instead made the need for reform clearer.